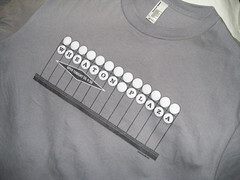 just up the pike: essay time: the "car corral"
essay time: the "car corral"
WHAT'S UP THE PIKE: Sandy Spring residents take road dispute to elected officials' homes; Chevy Chase resurrects "Purple Line Loop"; Glenmont redevelopment goes back to drawing board; D.C. bar owner calls for Fillmore boycott in e-mail. Cars back up onto Old Columbia Pike at the Fairland Center, currently housing my brother's elementary school. The most exciting part about Winter Break at home has been picking my little brother up from elementary school. 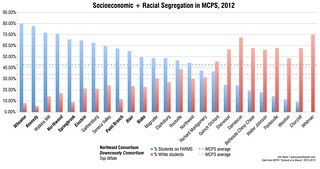 His school is being "modernized" this year - MCPS has always felt that "renovation" was not grandiose enough a term - and they have taken up the Fairland Center on Old Columbia Pike until May. Built in the 1930's and expanded in the 1960's, the Fairland Center looks like a sort of Franken-school, the child of Old Blair High and a ranch house. Since it closed almost thirty years ago, it's served as a "holding center" for schools under renovation, and each year a new crop of parents will raise fears that their kids will wander off the playground and to their deaths in the path of an eighteen-wheeler on The Pike. In response, a tall chain-link fence was wrapped around the playground to prevent this from happening. At 3:20, ten minutes before school lets out, the playground becomes a sort of "car corral" for all the parents too lazy to get out and walk their kids to the parking lot. As it remains chained-up during the day, opening the corral is always a big production. 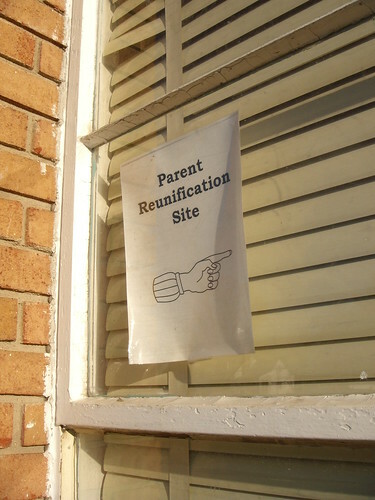 A sign in a window facing the playground, perhaps left over from the school that was here before, ominously calls it the "Parent Reunification Site," as if this was a work camp. Cars back up onto Old Columbia Pike - sometimes in both directions, though left turns are forbidden - waiting for some administrator to appear, set down a series of little orange cones to guide the cattle through the turn-around. 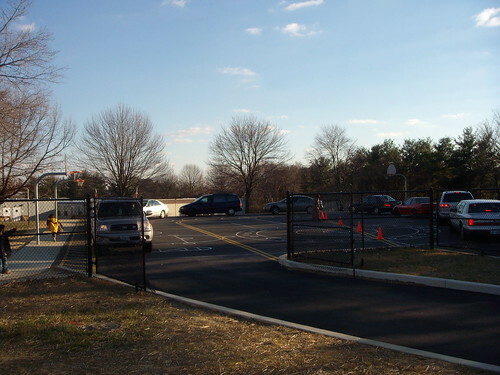 Unceremoniously, she opens the gate, and the S.U.V.s and minivans file through eagerly. 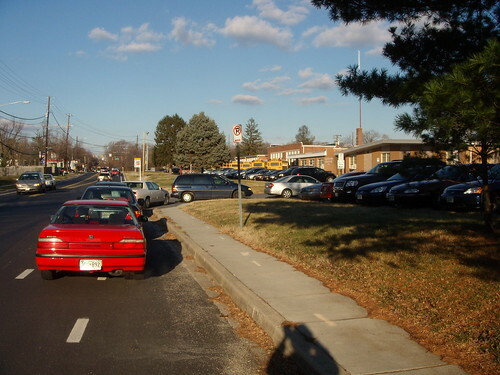 The daily parade of S.U.V.s and minivans through the car corral after school. I am one of a handful of people who actually parks my vehicle and walks over to the school to collect a kid. This happened a lot more at the old school, and my mother would socialize with the other parents and grandparents in the lobby while waiting for their kids to be released. One elderly gentleman had a habit of going to use the girls' bathroom while waiting for his grandson; until the move, no amount of complaints from the other parents and the administration would stop him. (Apparently, he would feign not being able to speak English to get away with it.) Today, he waits with me outside the school, and I am glad to have the company. At 3:30, class is dismissed, and the future of America bounds out of the school. A woman in a beret stops each kid before running into the corral. "Which car is yours?" she asks. "The brown one," the child will say, and he is allowed to reunite with his parent, guardian or babysitter. The kids all look the same to me - black, white, brown, whatever. I guess that means I'm colorblind. I have to catch myself a couple of times before moving towards the door, expecting to see my brother shuffling across the pavement when, in fact, it is not. It takes far too long to get out of the parking lot, because the line for the car corral - which by 3:35 still pokes out onto Old Columbia Pike - is blocking the only way out. I don't want to curse out the parents in the elementary school parking lot. Something tells me it's not a classy thing to do. So I wait, and mutter under my breath in the hopes my brother hasn't already heard these words before (but he has anyway, thanks to his classmates), and eventually we make that right turn out into the real world and back home. The old school, in the midst of "modernization," looks like an ancient ruin, windows knocked out and walls intentionally crumbling. But when I drive past it at night, the inside is lit up (to keep trespassers from tripping and suing MCPS for negligence, I like to think), and it looks kind of beautiful. I will stick with the Fairland Center and the car corral for now.